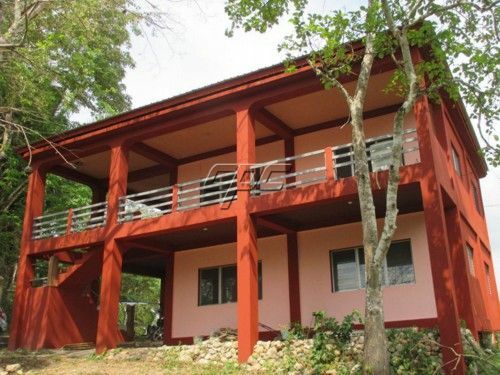 This two stories / duplex home is located in the north of San Ignacio just a few minutes drive to downtown and to Bullet Tree Village. It is built on a 1/2 acre fully corner lot and each of the both floors has around 1200 sqft. This includes 2 bedrooms, 1 bathroom, kitchen with hardwood cabinets and open concept living and dining area on each floor. Both are tiled throughout and boast tall ceilings. This floor comes fully furnished including refrigerator and washing machine. and washing machine. The floors have separate entrances. This gives the opportunity to live in one apartment and rent out the second. Or it can serve as investment in a rental property. The yard has different kind of fruit trees such as coconuts, custard apple, avocados and bananas.